The certificate, long the humble sidekick to the degree, is on the mind of many of our clients. If, the speculation goes, degrees are becoming too expensive, taking too long to complete, or sometimes held hostage by out-of-touch faculty, perhaps certificates are a faster, cheaper, more relevant alternative. Some schools even worry that certificates might not only supplant degrees, but that entities other than universities will lead the charge. Is there evidence that the certificate is muscling in on the degree market? On the surface, the numbers are impressive: undergraduate certificates saw 53% growth in completions over the past 20 years, and graduate certificates a massive 247%. But let’s look at the bigger picture. Degree attainment has also grown markedly, and there are serious issues with the extent and quality of certificate data. First, degrees. Figure 1 shows the number of degrees and credit-bearing certificates conferred in 2016/17—the most recent year available—and growth over the past 20-plus years. This data suggests degrees have little to worry about. Undergraduate certificates have indeed grown strongly (53%) but were no match for associate and bachelor’s degrees (70% and 65% growth, respectively). 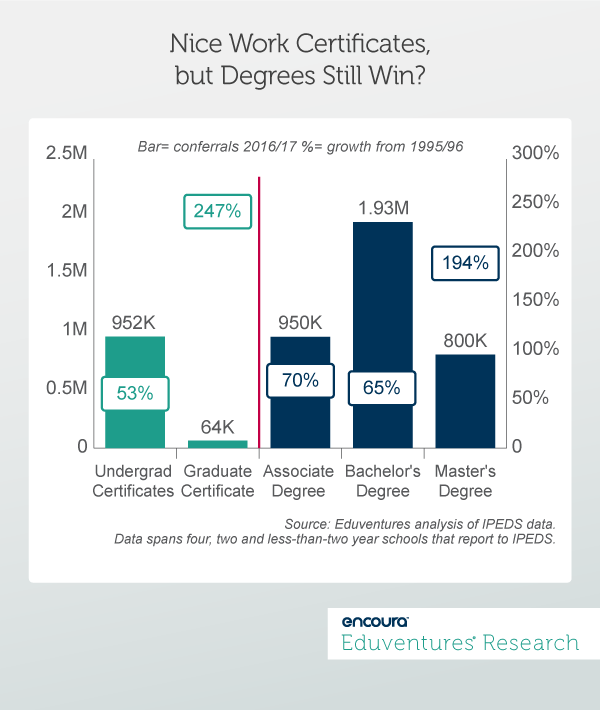 In fact, associate degrees have caught up with undergraduate certificates, while conferral numbers for both have fallen in recent years in line with overall enrollment declines in U.S. higher education.Source: Eduventures analysis of IPEDS data. Data spans four, two and less-than-two year schools that report to IPEDS. Graduate certificates posted the fastest growth of all (194%) but from a modest base. Far more additional master’s degrees than graduate certificates were conferred over the period. But not so fast. Does Figure 1 tell the whole story about certificates? The dirty secret is that certificate data leaves a lot to be desired. In our research, it is commonplace to find big discrepancies between the number of certificates reported to IPEDS—the federal postsecondary education database—and the number listed on the school’s website. This is particularly a problem at the graduate level, and appears to stem from an ambiguity in federal reporting requirements. Look on the Institutional Research (IR) page at many schools and you will see reference to “IPEDS Award Definitions.” For example, the University of Illinois’ page says that IPEDS defines a post-baccalaureate certificate as “18 semester credit hours” beyond a bachelor’s, and a post-master’s certificate as “24 semester credit hours” beyond a master’s. Many certificate programs are shorter than these minimums, which means that schools may not report all their certificate enrollment or conferrals to IPEDS, under-counting certificate volume. Curiously, such IR pages never actually link back to an IPEDS source. You will look in vain for these definitions on IPEDS today. The 2017/18 IPEDS Data Collection System completion guide defines both types of certificates without reference to any credit minimum. In fact, the definitions cited by University of Illinois and other schools refer to an out-of-date IPEDS glossary. The last time the IPEDS glossary used credit minimums to define graduate certificates was in the 2011/12 academic year, yet schools continue to cite the old rules. A second problem with certificate reporting concerns: Gainful Employment regulations. Primarily aimed at for-profit schools, this Obama-era regulation—suspended by the current administration—requires all federal aid-eligible programs at for-profits and federal aid-eligible non-degree programs at nonprofits to report annual completion and debt repayment data. For low-enrollment certificates, some schools have decided to avoid the bother of Gainful Employment reporting by making the program ineligible for federal aid. A third reporting issue is that IPEDS guidelines instruct schools not to report certificate awards if the student is also awarded a degree at a higher level (e.g., a certificate plus a master’s degree). Institutional and policymaker enthusiasm for stackable and modular credentials, designed to boost student achievement and employability, neglects this degree-centric rule. If a certificate is awarded by a third party—not the university or college—it may go unreported entirely. Our reading of the current IPEDS reporting rules is that all schools that participate in the federal student aid program are required to report enrollments and completions on all credit-bearing programs, including certificates, regardless of length. But it is not hard to find examples of schools with lots of certificate programs but zero or few completions reported to IPEDS. University of Wisconsin, Madison offers about 60 certificate programs but reported zero certificate completions—undergraduate or graduate—in 2016/17. East Carolina University lists about 70 “U.S. Department of Education Approved Certificate Programs” but reported that only 72 people completed a certificate in 2016/17. About 30 certificates are offered by University of Illinois, Springfield, but the school awarded certificates to only 29 people in 2016/17. The university lists all certificates shorter than 18 credit hours as ineligible for federal aid. Scrutiny of the university’s IPEDS returns suggests that only completions in eligible certificate programs are reported. In such cases, most of these certificates programs must be market failures, brand new, only enrolling degree students, ineligible for financial aid, or—most likely—there is some serious under-reporting going on. The rise of MOOC certificates and other so-called micro-credentials muddies the water yet further. Coursera, edX and Udacity have moved away from free courses to a focus on paid certificates and degrees. These platforms do not disclose very much about certificate enrollment or conferrals. But with hundreds of certificates available and an audience in the tens-of-millions, a six-figure annual conferral volume is not far-fetched. In 2017, Udacity says it had more than 50,000 nanodegree students. Other scaled-up companies, such as Lynda.com, Pluralsight, and Udemy, offer certificates of their own. These certificates span undergraduate, graduate, and noncredit offerings. Many certificates are awarded by partner universities but others are awarded by companies. Udacity, the MOOC platform least dependent on universities, explicitly positons its certificates—a.k.a. nanodegrees—as degree alternatives. The company prides itself on its array of corporate partnerships; firms that both co-design certificate programs and see the makings of a talent pipeline. Most certificates conferred via MOOC platforms are not reported to any government or central entity. Schools and companies crave market intelligence about these novel credentials but the absence of a centralized dataset keeps everyone guessing. The very power of certificates—short, often noncredit, largely unregulated—means that practice is miles ahead of good data. Commercial and other nontraditional providers and a growing number of universities are taking the lead, typically without the public subsidy that drives federal reporting. A lack of data makes the certificate thesis both more tantalizing and less discernable. So how to judge the impact of certificates? In the end, the market will reveal all. 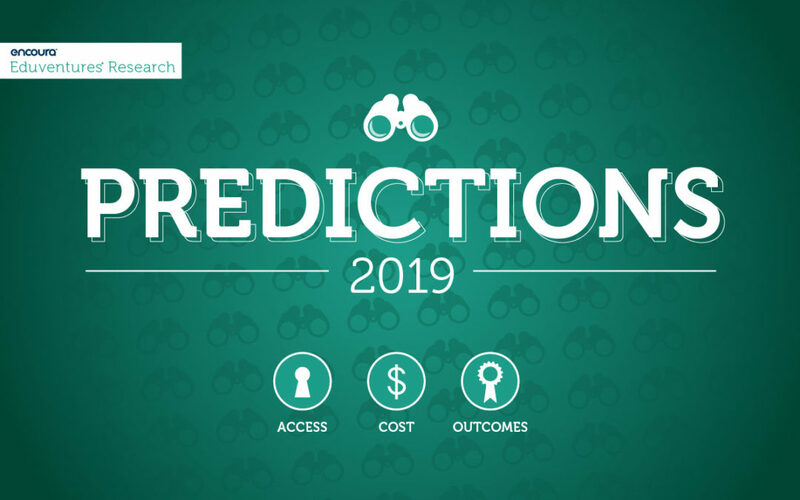 We predict that within two years, today’s leading MOOC and commercial certificate providers will start to announce big certificate enrollment and completion numbers. Once the figures look good enough, providers won’t hesitate to trumpet their success. We will then be in a much better position to gauge the impact of this new wave of certificates, although a wild west of definitions and reporting standards will ensue. If such enrollment numbers are not forthcoming, then degrees can rest a little easier. In the meantime, colleges and universities, please report ALL of your credit-bearing certificate to IPEDS. Thanks 🙂.